Early in development, Tuque Games brought in Thwacke to consult on their upcoming Mechwarrior-meets-Diablo action RPG, World War Machine. We assembled a team of experts consisting of nanotechology researcher Kevin Neibert and Aerospace Defense analyst Greg Linton to create a unique and authentic sci-fi experience. We worked extensively with the developers at Tuque Games to help build the technology behind the dream mech. There were a lot of questions to answer. What would it be made of? How would it be powered? What kind of weapons could be outfitted? By the end, we were all a little bit surprised just how "real" these monstrous killing machines had become. The first thing our team worked on was to set the scientific foundation for the structural and functional materials to build our mech. We saw a unique opportunity to incorporate a wide range of metamaterials including ceramic fibres, superalloys and carbon nanomaterials into the game, each with their own unique physical and chemical properties which could be exploited for a variety of potential applications in the game. So what sort of materials could be used to make up the chassis of the mech? We think the answer is carbon. Well, nanocarbon to be more precise. Although carbon is traditionally viewed as the stuff that makes diamond and graphite pencils, our ability to manipulate this element at the atomic scale has created a vast repertoire of nanostructures that could be useful for everything from structural and mechanical support to shielding and electroactive/conductive materials. These carbon-based materials can be used to craft a variety of tools, weapons and equipment to arm your mech. For example, long, thin tubes of carbon, called carbon nanotubes, are currently the strongest material to have ever been tested, coming in at about 100 times stronger than steel. Carbon nanotubes are extremely lightweight and can be woven or spun into fibers which are extremely sturdy and flexible. These fibers make up an integral component of the structural chassis and armor system. So how do you fuel a 15-foot machine that can deal as much damage as it takes? We provided Tuque Games with the scientific background and rationale for several potential power options ranging from solar to algae biofuel and radioisotope fuel cells. Given a 500-year war, we rationalized the mech should be powered by a radioisotope thermal generator (RTGs). These generators consist of an array of thermocouples that convert the heat released by nuclear decay into electricity. Mechs could scour the wasteland looking to extract radioactive elements from the soil, abandoned nuclear research buildings or even from each other. RTGs in today's technology can be found in the engineering of space-related machinery such as orbiting satellites and the Mars Curiosity. And in a post-human world, there's no need to worry about radiation sickness. Target locked. Fire... Death from above! WWM's arsenal is expansive, between guided missiles, rail guns, and special abilities called "functions", there are many creative ways to approach combat. One of the most powerful weapons at the player's disposal is the Orbital Strike. The orbital strike is a satellite-based kinetic energy weapon that can deliver a massive and devastating strike. It involves shooting a tungsten rod at extremely high velocity from space which has the explosive yield of a small nuclear bomb. Since Sputnik, satellite technology has rapidly evolved providing the conceptual background for space based weapon. In the real world, such weapons systems are prohibited by an international treaty limiting the proliferation of satellite-based weapons of mass destruction. We believe that a certain degree of scientific plausibility will help draw the player into the function and immerse them within the WWM universe. Hopefully this gives you a little taste of some of the real world science that goes behind the scenes as part of our collaboration with Tuque Games. 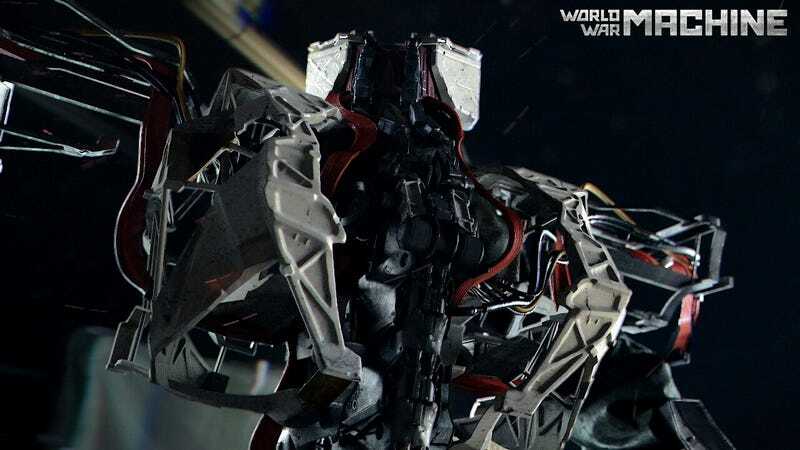 World War Machine is currently going through a crowd funding phase so if you like what you see be sure to check out their Indiegogo page! Sebastian Alvarado is a postdoctoral fellow at Stanford and founder of Thwacke! For more science and video games follow him on Google+, Twitter and Facebook!